Opera has finally released its free and Unlimited VPN app for Android, after integrating its VPN technology into its desktop browser and iOS app earlier in the year. Opera’s idea of offering its service with completely free unlimited access is going to put pressure on a lot of the paid-for options out there. This is huge especially to those who uses public network but are restricted from accessing certain sites of interest. There are several free VPN services for Android to pick from, but if you’ve been on the lookout for a relatively decent free VPN on Android that won’t break the bank, Opera is here to save the day. 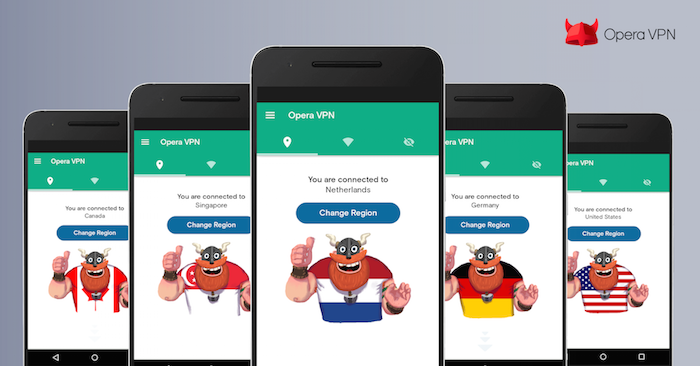 Opera’s VPN app for Android lets you lock your location to a specific region anywhere in the U.S., but it also lets you route your traffic through Canada, Germany, Singapore, or the Netherlands so you can access any blocked content. The app offers up a quick button to mask your location, which will default to the nearest supported region. Apparently, more virtual locations are on the way. Additionally, Opera VPN app blocks ads and ad trackers, though the app itself has a few of its own. You can also check the safety of any Wi-Fi connection with its built-in security test, which checks for connection encryption and identifies any potential security threats. If the risk of using a free VPN service hasn’t put you off, you can download the Opera’s free VPN app for free from the Play Store below.